Here are two winter blossoms. 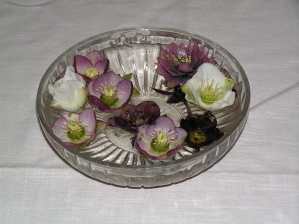 The flowers on the right are hellebores. 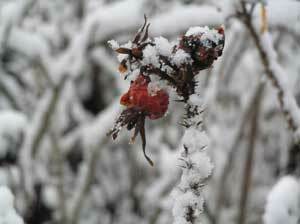 They usually bloom in January, so they make a pleasant surprise, especially when the ground is covered with snow. They don't just bloom in the Northwest, a few years ago we noticed them blooming in Madison Square Park in New York City. One of the foremost hellebore nurseries is located on the Olympic Peninsula. Heronswood Nursery is not far from the car ferry in Kingston, and they have a wonderful winter garden full of hellebores and other winter blooming plants. The flowers on the left, enlarged a bit in this photograph, are rosemary. That's right, the familiar herb. 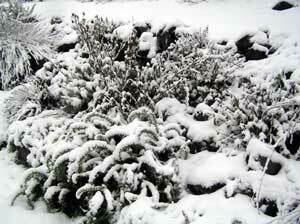 Rosemary is a tough plant with its resinous leaves, and it blooms in the winter, even when there is snow on the ground. 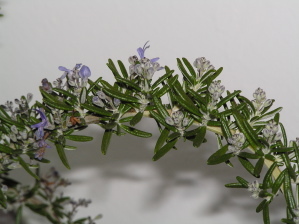 Unfortunately, rosemary doesn't make a great floral display. It tends to lose its leaves, though you can save them and use them in cooking. The biggest downside is that it smells like good cooking, so it tends to encourage any craving for pasta with red sauce. 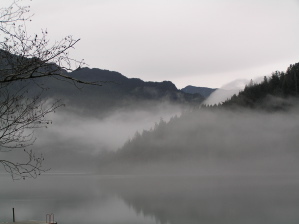 It was misty out at Lake Crescent the other day. We were out at the Spruce Railroad Trail today, hoping for a walk around Lake Crescent. The snow and the ice have all melted, but you can see the tree damage caused by the heavy snow load and the strong winds. In fact, the winds were pretty strong today and were blowing around a lot of the little twigs and branches on the ground. There were white caps on the lake, and there were breakers at East Beach. You could see them from the road. As for the trail, it is rough going. A lot of trees lost branches, and a lot of those branches, and in some cases entire trees, are blocking the trail. You can make your way along, but it is rough going. We cleared out a bit of this and a bit of that, then we gave up and went home. With the high winds still shaking the boughs, we were spending a lot of our time heads up, watching for potential deadfall. We'll give things a few days to settle down and then we'll check things out again. 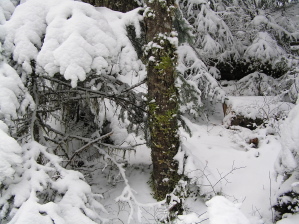 Not only did it snow big time in town, but it also snowed big time in the Olympic National Park, and wonder of wonders, Hurricane Ridge road is open to the ski area at the top. There is a bit of snow on the road, but they've cut and hauled all the downed trees, plowed the snow, removed the rocks and sanded the pavement, so it is a pretty easy drive as these things go. 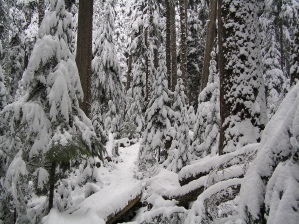 If you don't feel like going to the top, there is great snow shoeing on the Lake Angeles Trail. The trailhead is down the road on the right just before the entrance station on Hurricane Ridge Road. If you do go, check out the snowman in the picture on the right. 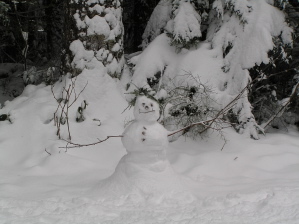 He's near the start of the trail. Then check out the snow. 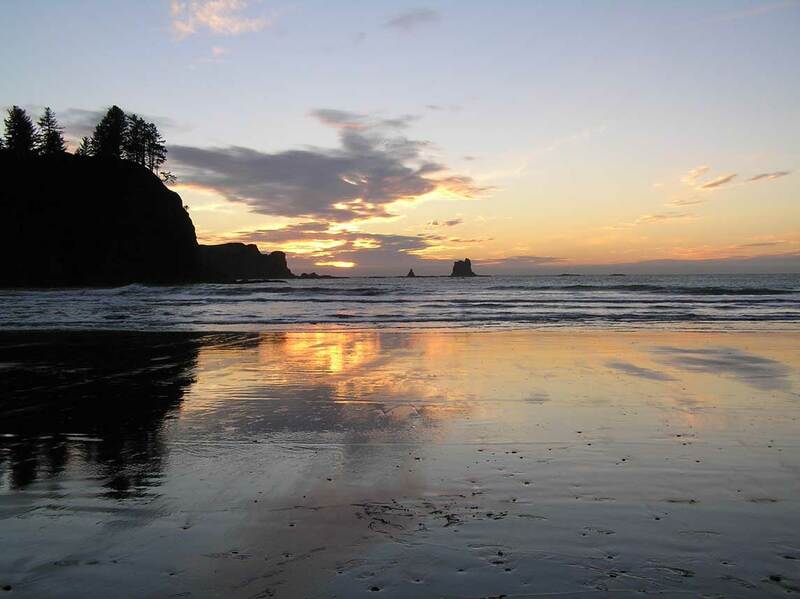 If you are planning a trip to the North Olympic Peninsula, consider trying out NOAA's new experimental point forecasting system. 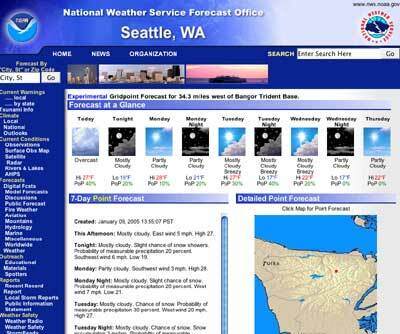 It works like their ordinary weather web page. You can search for a city and state or by zip code, but there is also a little topographic map of the region that you can point at to get a forecast adjusted for the precise elevation and location you specified. This forecast includes the usual five day conditions, high-low temperatures and chance of precipitation, and the seven day forecast discussion. We're not absolutely sure of the algorithms they use, but this is a lot like the way they do tide tables. There are a number of base stations, where they actually work out the harmonic tidal formula, and then there are the derivative stations that use the tide from a nearby base station and apply a time offset and tide height multiple. The forecast on the right is for "34.3 miles west of Bangor Trident Base", so Bangor is probably the relevant forecast base station. They probably use a version of the spatial grid forecast data for predicting temperature and precipitation probabilities. It's really kind of neat. Our tax dollars at work! 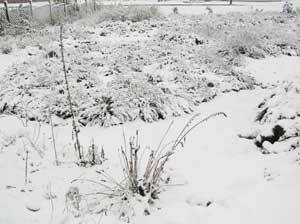 We don't often get a real snow here in Port Angeles, but we're getting one today. Our house is only a few hundred feet above sea level, so we only have two inches or so, but everything is under a blanket of white. We didn't get out much, but we did walk around the yard taking pictures. That's a rose hip on the left, with our lavender beds below that, and one of our creeping rosemary plants rising from the rock garden below. We were shopping for some Christmas presents in Port Angeles and dropped into the old Bead Tree store in the newly restored Elks building. The Elks buildings is sort of our local skyscraper and has recently recovered from damage from a fire a year ago. The camera store was back along with a new Internet cafe. There was also the bead store, but not the bead store we remembered. The old bead store was a bit austere, for a bead store, that is. The new place was lush, with bins and strands and boxes and tubes of beads of all shapes, sizes, colors and levels of specular reflection. Udjat has two rooms full of everything you might ever need for stringing beads. They also have a variety of belly dancing accessories. 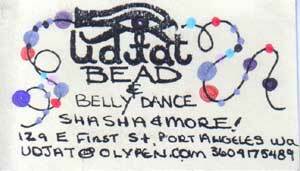 Belly dancing has been getting quite fashionable, both as dance and as exercise. If nothing else, it builds up the abdominal muscles, and you can work up a sweat. We didn't investigate their belly dancing products in detail, but they don't stock the DVDs. They do stock the decorative scarves and some shawls, and you can design your own accessories with their full line of beads. Do we have great sunsets around here or what? We were out at Second Beach near La Push and couldn't help noticing a rather pretty sunset. The sea stacks, in silhouette, were pretty neat too. 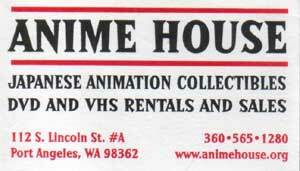 We've been meaning to mention Anime House for some time now, but just haven't gotten around to it. We've been comic fans for years. We even remember when you could buy comic books at supermarkets and drugstores. That was a long time ago. 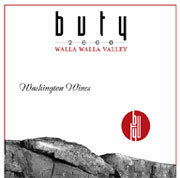 Now you have to go to a comic book store, and that was a problem in Port Angeles. The nearest comic book store was in Seattle (or Silverdale, where ever that is). Then, Anime House opened, and we can get all of our comics right in town.